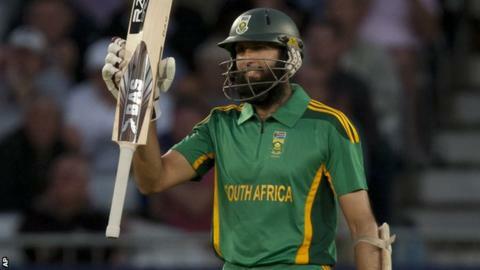 Hashim Amla and AB de Villiers hit half-centuries as South Africa cruised to a seven-wicket victory to tie the one-day series with England 2-2. Amla stroked a majestic 97 not out and De Villiers cracked an unbeaten 75 after James Anderson (2-41) helped reduce the tourists to 14-3. England were guilty of poor shot selection in their 182 all out. Alastair Cook top scored with 51, while Robin Peterson took 3-37 and Dale Steyn and Morne Morkel took two wickets each. It was fitting it was Amla who helped South Africa level the series, in a summer in which he has dominated the England bowlers. "England have been extremely disappointing here. These are two great teams that have won two games apiece, so from a distance you'd think that the series has been a cracker, but the games have been one-sided. "The one plus from the series is that, although he fell today, Ian Bell has a slot there as an opening batsman. Tredwell showed he's a good stand-in for Swann, and although people criticise his strike rate, if Trott had played today, he might have shored things up." England's total may have been inadequate but South Africa were wobbling early in their reply after Jade Dernbach induced a Graeme Smith edge to second slip, before Anderson had the nervous Faf du Plessis and Dean Elgar caught behind. However, another assured and classy innings by Amla, complemented by a counter-attacking knock from De Villiers, saw the tourists to a comfortable victory. After scoring 482 runs in the Test series, which South Africa won 2-0, Amla took his run tally to 335 in the one-day series and 817 for the summer. England could only blame themselves for posting such a disappointing score in good conditions on a pitch which did nothing out of the ordinary for the bowlers. The tone was set when opener Ian Bell, who looked in good form, missed a straight one from spinner Robin Peterson in the fourth over. Ravi Bopara followed soon after when he was dismissed for a second-ball duck by Steyn - meaning he ends the five-match series with an average of 5.5 from his four innings. The Essex batsman was elevated to number three in the absence of the injured Jonathan Trott, but his dismissal was one of a man shorn of any confidence as he edged a routine delivery behind while standing rooted to his crease. Cook and Jonny Bairstow repaired some of the damage, putting on 55 for the third wicket, but, as they started to regain some momentum, they were separated. Bairstow was beginning to dominate the Proteas bowling when he went to 29 with a lovely pull for four off Morne Morkel, but the Yorkshire youngster got carried away next ball when he flicked one deep into the leg side and watched with horror as he picked out Justin Ontong on the boundary. It was a poor way to lose a wicket, and almost as bad as Eoin Morgan in the next over. The Irishman came running down the track to part-time bowler JP Duminy and hit the ball straight to Amla at mid-off. England's only hope of a big score rested with their skipper, but Cook was guilty of poor shot selection himself as he drove a full toss straight back to another occasional bowler in Du Plessis. From there, wickets tumbled regularly as England struggled to form any good partnerships - Craig Kieswetter and Chris Woakes offering the only resistance with 33 runs each. It appeared the total might be enough when Anderson and Dernbach exploited some early movement in South Africa's reply, but once Amla and De Villiers took control there was only going to be one winner.